"Of all creations meant to move men where they will, surely sailing ships are the most majestic. There is majesty apparent in the form, but also in the acceptance of the contest, in the daring to pit frail material and human skill against unlimited and impersonal power. Although the wind still commands wherever it can reach, men have learned that  within obedience  they can win a subtle victory." While roaming the shores of Nevada’s Pyramid Lake three summers ago, I unexpectedly came upon the battered hull of a wooden sailboat. By the looks of her, the desert sands had been blowing in and out of her splintered keel for a long time. While I knelt to examine her more closely, a shadow fell across her foredeck. Startled, I looked up, into the face of an old Paiute. "I didn't mean to scare you, son." He said with a broad, crinkled smile. "What do you think of my boat there?" I scrambled to my feet. "I bet she was a beauty." "I guess she was, but I really don’t know very much about boats." He replied. "A fellow left her here four or five years ago. He got hisself caught in a storm out there and couldn’t get back to his camp. He tried to ride it out in the shallows here in the cove, but tore the bottom out on some rocks. He was able to get the rigging to shore, but the boat sank. If the water level hadn’t dropped so much the last few years she’d still be on the bottom." "Naw, he wasn’t hurt. Just scared and cold. I came along a few minutes after the storm blowed through. I was checking on my cattle. Anyway, he said he had no way to raise the boat, so he was just going to leave it. Said she was all mine if I would take him back to his camp. I did, and that was that." "Did he take the rigging and running gear with him?" "No. He said he was through with sailing. I got everything up in my barn. Don’t know what most of it is for, but I think it’s all there. I really haven’t paid any attention to it since then. I seen you down here and thought maybe you was the fellow come back." "What are you gonna do with her?" I asked. "What I been doin’, I guess: Nuthin’." "Well, if I could get her out of here I might be interested, but I don’t know how I’d do it. What kind of shape is the gear in?" "Don’t know nuthin’ about it. Why don’t you walk up to my place and see for yourself? It’s just up the hill there." After what seemed like miles, the trail crested the hill, revealing a rundown homestead. As I caught my breath I took in a magnificent view of the lake. "The barn’s over there," said the old man, pointing. Next to it was an old gray Ford tractor, a hay wagon, a fleet of stripped out pickups and cars, and countless other pieces of rusted junk and clutter. Everything seemed to belong. "Side door’s unlocked," he said. "Go look at the gear while I try and start the tractorwe may need it." The gear was in good shape. By the time I had finished inspecting it, he had backed the tractor up to the hay wagon and was about to hitch it up. "Gear all right?" he asked. I nodded, and he dropped the pin in place. "How much you want for her?" I asked. "Hundred bucks, and I’ll take her right to your camp." "You got the paper work?" "Hell no, I ain’t got paper work! Take her as she is." "You’ll make me out a bill of sale?" "I’ll sign it if you write it up." "O. K." I said. I then introduced myself and asked him his name. "Nice to meet you, Mac. Let’s do it then." "What kind of rig you got?" he asked. "Do you have a way to haul the thing off?" "I’ve got an old 440 Dodge RV with a flat roof. I think she’ll ride tight if I can get her up there." "Hop on the wagon. We’ll pick up the rigging on the way back up to the road." "Now, what have I gotten myself into?" I wondered as we bounced and rattled back down the hill. I consoled myself with the thought that even if I couldn’t repair the hull the rigging alone was well worth the money. "Here, tie this onto that handle on the front." he said as he threw me a coil of frayed rope. We’ll drag her out of the sand and try to load her up on the dirt. Hope she don’t break apart. She looks kind of content where she is." "Content!" I thought to myself. "If I ever get her fixed, that’s what I'll call her." 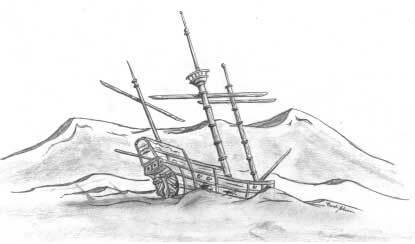 I had recently read some stories about the mysterious disappearance of the English privateer, Content, in the Gulf of California in the late 16th Century. Indian tales of the discovery of such a ship had made their way to Jesuits living in Lower California throughout the Spanish colonial period. 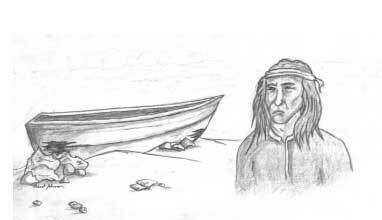 The bearers of the tales claimed that their ancestors had found a great wooden ship anchored in a bay. Attempting to cook surviving food stores while still onboard the vessel, they accidentally set the ship ablaze, causing her to sink. If she was the Content, she went down with a treasure worth some five million pesos. The Jesuits believed that the ship was indeed the Content, one of the English ships that had plundered the Spanish galleon, Santa Ana. They reasoned that the ship had probably become trapped in a temporary inland bay before she sank. Eventually her watery grave receded, but within a short time, she was re-entombed by blowing sands. "If this old ghost ever sails again," I thought, "she’ll deserve a grand name like that!" It might have been my imagination, but the boat appeared to roll slightly, as if she were in the water, as I tied a mooring hitch to the bow handle. The old man tied off the other end to the wagon. At first, I thought the rope would snap, but it held, and a few moments later, the boat was resting on hard ground. I scooped the remaining sand out with my hands, and then we lifted the bow and rested it on the back of the wagon. We lifted the back end and slid the boat the rest of the way. After lashing it down, we headed back up to the barn to get the gear. "Where you camped?" Mac asked after we had removed the gear from the barn and secured it to the wagon. "About two miles south, around the point." "O.K. We can catch the road up here just over the next hill. You got cash?" I told him that I did, and we set out. An hour later, I was alone in my camp with a broken down sailboat and a whole lot of misgivings. I decided to rig her up just to see how she would look. The sails were bright yellow, and they had only a few holes in them. The rudder, tiller and center board were weathered, but they all fit. From a distance she looked like a fair craft. I left her rigged for two days because I enjoyed looking at her. With a great deal of effort and a little ingenuity I was able to flip the boat over and hoist it onto the roof of my RV. I figured she would ride better that way, and I could do repairs without having to take her down. In Truckee, I bought hardware cloth, resin, fiberglass, sandpaper, wooden strips and anything else I thought I might need. I made camp at a small lake nearby, and for the next two days, I worked diligently at making my Content seaworthy. The big day came at last. I wrestled the boat down and into the water, rigged her up, and away we went. At first, she handled pretty well, then she began to ride lower and lower in the water. When I tried to pull her back up on the beach she wouldn’t budge. She was full of water. I drilled two small drain holes back by the gudgeons, then made plugs out of doweling and duct tape. I reworked the patches and tried again the next day. This time they held. For the remainder of the summer, I spent my days sailing some of the most beautiful mountain lakes in northern California. When I returned home, I went to a boat store to get new halyards and a main sheet. While I was waiting, I went outside and walked through the small yard. There in a corner sat a hull exactly like the Content, but it was immaculate, bright and shiny. The store owner said he had no rigging for it, but he would sell it for 100 dollars. I put half down and paid the rest when I picked it up. During that time, I began to read everything I could find about lost ships of the desert. I found references to Indian accounts that went back four centuries, while modern sightings have been reported as recently as 1933. In between, numerous explorers, 49ers, desert dwellers, prospectors and campers claimed to have seen mysterious ships of all descriptions in the desert sands. Stories of mysterious metal discs, immense timbers, oak ribs protruding from the sand, and precious jewels served to peak my curiosity. The more I read, the more convinced I became that the legends were more than mirages, yarns or the ravings of sun-crazed prospectors. I was surprised and intrigued to learn that so many people accepted the notion that a large ship could have made its way to the Colorado Desert in the first place. One of the first articles I read explained how this could have happened. Ancient Lake Cahuilla once covered the Imperial and Coachella valleys. Its waters came from the temperamental Colorado River, a history evidenced today by the ample deposits of fossilized fresh water mollusks in its dry lake bed. Since the Colorado River has a history of jumping its natural channel, it is logical to assume that it occasionally spilled into the Salton Sink. In fact, the river did just that in 1906, creating the Salton Sea. If conditions were right, a ship could have sailed up the Colorado River and into Lake Cahuilla. If it had been on the lake when the river returned to its channel it would have been trapped. Paleo-shorelines, or "bathtub rings," show that Lake Cahuilla has dried up and returned on numerous occasions during its long history. Any vessel left on the lake would eventually have come to rest on dry land. Though Lawrence Hogue does not mention lost ships in All The Wild And Lonely Places, his new book on the Anza-Borrego Desert, he still adds credence to the proposition. He explains that, due to the persistent actions of the Colorado River, all that separates the Imperial Valley and the Salton Trough from the Gulf of Mexico is 40 feet of loose sand. This condition has existed for millennia, during which time the river has flowed alternately into the gulf and into the trough. Separated by such a narrow barrier, it is a virtual certainty that at times this barrier has been submerged, allowing the gulf to extend far inland. Desert writer Philip Bailey offers another possible explanation of how a ship could have come to rest in the middle of the desert. He explains that bores (tidal waves) used to occur on the Colorado River when a deluge of river water collided with an unusually high incoming tide from the gulf, and was then pushed back upstream. The result could be a tidal flood of 30 feet or more. A ship caught in one could easily have been carried inland. He cites the case of a Captain Jack Mellen, who claims his ship was wrecked in such a bore in the 1860’s. Bailey even claims to have seen a lost ship himself. He and his friend happened upon a grizzled desert rat on the north ramp of Signal Mountain. The man offered to show them a lake mirage, but instead, Bailey reports, they saw a ship "...with her beam stuck into the ancient beach line that skirts the eastern front of the Superstitions. The curve of her beam showed plainly, and a stubby mizzenmast could be seen near the poop. I saw it myself." Perhaps the most interesting account in Bailey’s book is that of an old prospector known as Mac, who swore that: "I saw her and she ain’t no mirage. She was lying partly on her side with her nose buried in the sand, her three-decked stern sticking up in the air, and a bare mast raking dangerously from the decka craft whose keel was laid on a foreign shore...and darned if I don’t believe I saw a tall, bearded man in a fancy coat walk down her sloping deck and peer over the side." Intriguing as these stories and theories were, I still wondered if ocean-going sailing ships would have had occasion to ply the northern waters of the Gulf of California. Maritime historian George Wycherley writes that exploration of the upper gulf was carried out on a fairly regular basis during the 16th and 17th centuries. He explains that the Spanish and English in particular explored the region in the hope of finding the Straits Of Anian, a mythical all-water passage from the Pacific to the Atlantic. Discovery of such a route would have been a tremendous advantage to any nation seeking commercial and political gain in the New World. According to Wycherley, the Spanish erroneously believed that English privateers Francis Drake and Thomas Cavendish had already discovered and utilized the straits. In fact, one of Cavendish’s ships, the Content (and my boat’s namesake), is believed by some to have disappeared while making for the straits. Elizabethan chronicler Richard Hakluyt reported that Cavendish’s Content and her consort ship, Desire, had set sail for England heavily laden with plunder from the Spanish galleon, Santa Ana. Desire, with Cavendish aboard, lost sight of Content in the Gulf of California on November 19, 1587. Cavendish returned to a hero’s welcome, but Content was never seen again. Some authors speculate that her captain may have been unhappy with his share of the spoils and that he attempted to upstage Cavendish by returning to England ahead of him via the Straits of Anian. Had he discovered the route, he most certainly would have been received as one of the great heroes of his age. Since the straits do not exist, one can only speculate as to the fate of his ship. That it came to rest in the Colorado Desert is certainly not beyond the realm of possibility. The most recent sighting I am aware of is also one of the most intriguing. Myrtle Botts and her husband claim that on a weekend camping trip near Agua Caliente Springs in 1933, they saw what appeared to be a Viking ship perched on a steep canyon wall. Western writer Choral Pepper interviewed Mrs. Botts in her home in the late 1960s. At that time, Botts was a librarian in Julian, California. She related that on a tip from a wandering prospector, she and her husband had hiked up a canyon, and there, to their amazement, sat the ship. Lacking a camera, they took note of their surroundings and vowed to return. About the time they reached their camp, a powerful earthquake struck, throwing them to the ground. On their return trip, they found that the earthquake had filled the canyon with tons of debris. The ship has never been seen again. The more I learned about the lost ships of the desert the more convinced I became that my old boat should be honored with membership in that mystic armada. On a hot April afternoon, I headed out toward the Salton Sink with the Content in tow. I intended to camp on BLM land and to set her spirit free by burning her that night. The legality issue troubled me greatly, but I was convinced it was the right thing to do. I arrived at camp too early, about 4:00 p. m. The blaze would have to be after dark, but the sun was still high in the sky. It was also very hot, with a strong dry front wind blowing from the west. I sat on the shady, leeward side of my truck, but the hot wind blew under it and hit my legs like motorcycle exhaust. I thought nightfall would never come. Finally, the sun set and I relaxed a little. It was time to do it. I backed the trailer and off-loaded the boat. She slid off willingly and settled on the bier, bow down and listing to port. She looked like a model boat on a stand, caught in an attitude of motion. I piled paper, kindling and small pieces of plywood around her hull. Just before I lit the fire, she began to roll gently. There was a great deal of thick, black smoke, but it was a moonless night, and I had no fear that it would be spotted. When the boat became fully engulfed I knew the fire would be seen for miles, but I trusted that it would look like nothing more than a pallet fire. The leaping flames tacked and tumbled as the stern gave up. It bent earthward, giving the entire mass the appearance of a humpback whale. Then the bow slumped in the same fashion. It was all over quickly, and I was relieved. 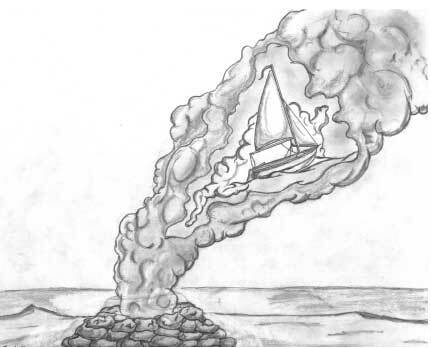 As I shoveled bits and pieces of boat back into the fire ring a soft breeze arose as if to blow my guilt away. After one last fiery fanfare, the little volcano became dormant once more. If in your wanderings, you should catch sight of a ship in the dim sandy distance do not doubt your sanity, and do not be alarmed. Believe what you see, and take joy in the knowledge that you have been granted a living vision of the past. And if that vessel should appear to be a little white sailboat with yellow sails, please do not report it to the BLM! Bailey, P. A., Golden Mirages. David, R., editor. Hakluyt’s Voyages. de Fierro Blanco, A., The Journey Of The Flame. Galbraith, D. "Lost Ships Of The Desert," Desert Magazine, March, 1966. Hogue, L. All The Wild And Lonely Places. Morton, H. A., The Wind Commands: Sailors And Sailing Ships In The Pacific. Pepper, C., Desert Lore Of Southern California. Pepper, C., "Ships That Pass In The Desert Sands," Desert Magazine, November, 1980. Wycherley, G., The Buccaneers Of The Pacific. Learn more about sand dunes. Learn more about what defines a desert. Learn more about the camel in the American deserts. View Video about Dust Devils. Born of the battle between the sun and sand, the dust devil is a rapidly rotating column of air that has wrapped itself around a rising thermal. The average dust devil is ten to fifty feet in diameter. The chief ingredients for a good dust devil are clear skies, a bright sun, and a dry hot surface. Click here to view video. Desert Food Chain Video - A food chain constitutes a complex network of organisms, from plants to animals, through which energy, derived from the sun, flows in the form of organic matter and dissipates in the form of waste heat. The food chain’s biological productivity and species diversification depend on factors such as the daily duration and angle of seasonal sunlight, the timely availability of water, the daily swings of seasonal temperatures, the chemical content of the soils, and the availability of nutrients.